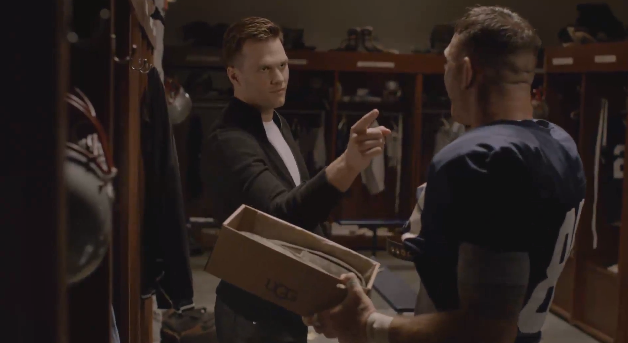 Inspired by Tom Brady's tradition of giving UGG footwear to fellow players as a way to say thanks, UGG Australia has launched Pink Slip, a new ad, created by M&C Saatchi LA, which features Tom Brady offering a pair of UGG Ascot slippers to a rookie player. The Pink Slip TV spot premiered on November 19 on ESPN, ESPN2 and NFL Network. On the day of launch, consumers received a dedicated e-mail directing them to view the commercial and behind the scenes video for Pink Slip on the UGG Australia web site and other social media platforms. The digital portion of the campaign will run on CBS.com, Complex.com, Hulu.com, NFL.com, Pandora.com andYouTube.com. Print will include Details and GQ magazines. OOH will run in New York City in the form of bus shelters, as well as billboards in Los Angeles. The media was planned and purchased by KSL Media Los Angeles, and PR was overseen by M&C Saatchi PR New York.